When my son was little, he would not touch popsicles. It seemed that they were too cold for him. However, he is 5 years old now and he LOVES these Mango Coconut Popsicles. As does his sister. This is the first popsicle recipe I made for both of them and is the first popsicle my daughter tried. These popsicles are creamier than a regular popsicle. My husband says that they are closer to a creamsicle than to a traditional popsicle. He also thinks that they taste a little like piña colada without the alcohol and pineapple. I haven’t tried a creamsicle or a piña colada, so I can’t tell you if I agree. What I know is that I like these popsicles and both my kids enjoyed them a little bit too much. The best part is that you can make a double batch and serve one batch as a smoothie and turn the other batch into popsicles. The smoothie is extremely delicious and goes well with a frittata or scrambled eggs in the morning. It works great as a snack too. 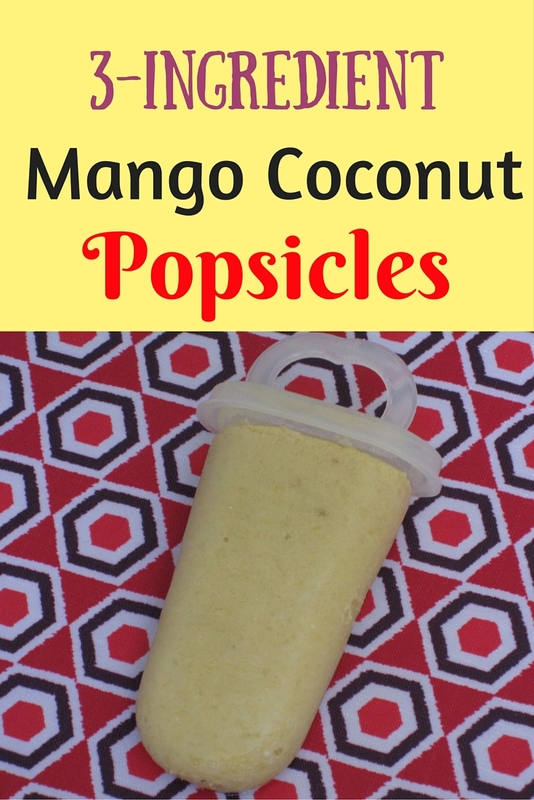 3-Ingredient Mango Coconut Popsicles. Extremely easy to make and delicious. Blend all the ingredients in a blender until smooth, pour into popsicle molds, and put the molds in the freezer for a couple of hours. Take the popsicle molds out of the freezer and run hot water on the outside. So sweet and yummy! I buy the can of coconut cream from my local health food store. You can make a double batch. Enjoy one batch as a smoothie and make popsicles with the other batch. What is your child’s favorite popsicle flavour?